No Cheese, No Bechamel — Ginger writes. I told TJ one day last week, after we met for breakfast at Tandem while our kids were at school, that as long as he lets me keep going to Tandem as much as I want, that’s all I need. That’s not really true, but I sure find a lot of joy in going to eat good food with good friends. Tandem is my welcoming committee that just won’t quit. Each time I go, I see people I know: people who work there and people who eat there. There’s actually nothing about the place I don’t like, so I can stop trying to make it sound amazing. It just is. 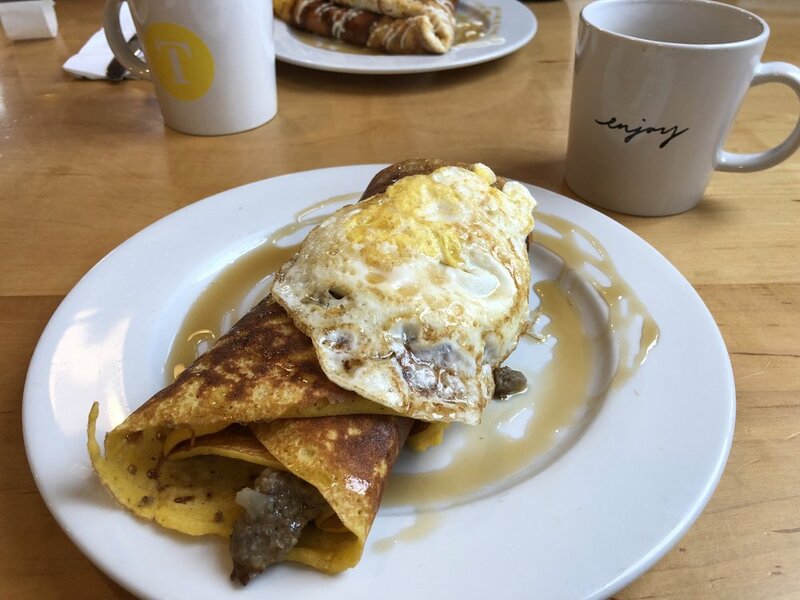 My favorite thing to get is the Sausage and Potato Crepe, made with Providence Farm sausage. I always request cornmeal batter, no cheese, and no béchamel. I also request extra Rosemary Maple Syrup. My second favorite crepe is the Banana Nut (nut indicating both nutella and walnuts) made with almond flour. After that, I love the specials: the Strawberry Nutella Waffle in spring/summer and the Apple Pecan Waffle in fall/winter. The Pumpkin Pie Crepe is also a fall favorite. I always order coffee or tea, occasionally an almond milk latte, and every once in a while I get the homemade granola with blueberries and almond milk. What I always get is encouraging time with a friend. I went this past Saturday with one friend named Kristy and I went for lunch again today with another friend named Kristy. I usually don’t plan back-to-back Tandem dates, but I’m also not opposed when it so happens. I leave full and thankful, often with leftovers for later. Cheers to that good feeling which comes from having a place of welcome at the table, as often as I can gather with a friend or two. Cheers to the generous portions of lovingly crafted food and drink. Cheers to money and time well spent. Cheers to taking the joy of the experience back out into the world. May our Thanksgivings be like a regular Tuesday at Tandem.